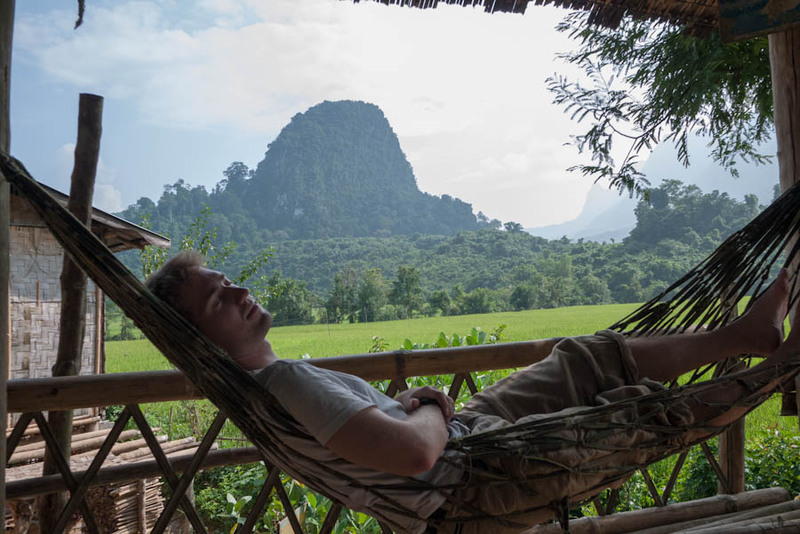 “They shut Vang Vieng down” – the buzz first reached me in Hanoi, where I heard the story from a girl who had heard it from somebody who was just there the other week. But for that statement to make any sense, you first need to know what Vang Vieng is. Vang Vieng is a city, and of course, you can’t really shut a city down. But that’s not what they meant. For years, Vang Vieng has been synonymous (for some) with the most hedonism. Vang Vieng was the Sodom and Gomorra of Laos. Tubing was introduced at the turn of the century; then, cheap guesthouses and bars sprung up on the riverfront. Laos has historically been rather relaxed about drugs (the hill tribes allegedly produced opium for the US during the ‘secret war’) and there was more than beer on sale – ‘happy pizza’s’ and ‘happy shakes’ abound; the mushrooms in your dinner could very well be the ‘magic’ variety and opium was not hard to come by either. Parties on Don Kong, an island in the river, went on all night, even though the people of Vang Vieng would traditionally rise before dawn to work in the fields. And as if tubing down a fast-flowing river while completely tripped out of your mind wasn’t enough fun by itself, there were rope swings, zip lines and giant slides (you can read a CNN story and photo report here). Photo courtesy CNN / Matt Benett – this now no longer exists. I think. If going down a giant slide nicknamed the ‘slide of death’ float down a river in an inner tyre tube while stoned completely out of your mind sounds like a bad idea it’s because it is. Apparently, 26 people died this year alone, and this caused the crackdown. Some say twice that number died last year and it’s because of that; others say a high diplomat’s son was amongst the recent casualties and that he pulled a lot of strings. If you ask me, it’s a good thing people making such basic Darwinian errors removed themselves from the gene pool, but the cleansing of Vang Vieng can only be applauded. Its setting is one of the most amazing in Laos, and opportunities abound for kayaking, caving, rock climbing, you name it. Vang Vieng might finally develop facilities for these kind of sustainable, high revenue activities. However, the town might be beyond redemption. Its name as an anything goes party centre been made. Even after mopping up the worst of the worst, the town still consists mainly of bars that show endless reruns of Friends and / or Family Guy; Whisky / Red Bull buckets are still ubiquitous (though to be fair, the ‘happy’ menu’s seem to have all but disappeared), and the town is teeming with good-for-nothing backpackers that stay for months just to ‘have a good time’ – ie., destroy traditional Lao culture. Then again, this is Laos, and no place is changing as fast. Maybe in five years. We’ll see. If overlooking China’s national week when booking (see previous post) was bad, overlooking Vietnam’s coastal typhoon season is really bad. I had looked at the climate graphs for Saigon in the South, and Hanoi in the North, and concluded that all would be fine. Sadly, both cities lie inland, and Vietnam is less than 100km wide in the middle – so there’s only coastal there, and that’s where typhoons hit, right about now. Traveling from North to South this time of year is not a good idea, so I decided to kick it to neighbouring Laos. 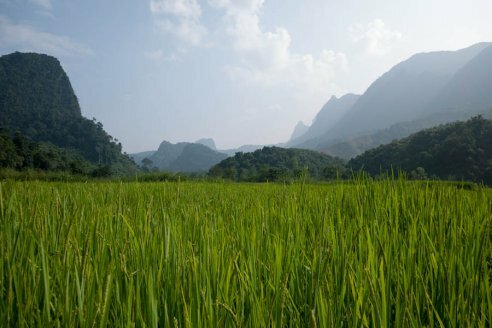 Though Vietnam now has several open land borders with Laos, most of these are of little use to most travelers, being quite a way from the major tourist destinations. Of these, the Tay Trung / Sop Hun in the far north is perhaps the most remote. From Hanoi, you have to take an overnight train to Sapa and then a minibus to Dien Bien Phu (it’s now also possible to take a direct overnight bus from Hanoi, but I avoid sleeper busses whenever possible), then a bus into Laos and then it’s another two days by boat before you get back to civilization. Dien Bien Phu, though probably known by most at least by name (it was here the French forces met a decisive defeat against Ho Chi Minh’s Viet Minh, effectively the end of Indochina), is of no interest to tourists: it’s nothing more than a dusty provincial town with one highway running through it and a few minor streets branching off. The road there from Sapa was atrocious. It’s only 150km as the crow flies, but it’s 280km by road. Of these, the first 180km took us a full seven hours. So abysmal was the road that even now, in the dry season, our Mercedes van had a hard time even getting across. Every time the driver hit a bump (which was always) the battered Benz made a sound like clucking hens. I felt a bit like a clutched egg myself at the end of the day. Still, it could be worse – at least it wasn’t hot. From Dien Bien, it’s another day by bus to Muang Khua in Laos. At least the road is now paved and so much more comfortable and almost always passable – before, the journey could take up to two days, if it all possible. Still, seven hours is a lot to cover less than 100km. Snaking roads and unexpected landslides that block our passage are as much to blame for that as customs procedures. I was warned about this crossing beforehand. Exit procedure at the Vietnamese side is easy enough, but getting into Laos is a different story. Laos does give a visa on arrival, but the customs officials are excruciatingly slow (‘do you think they could make it any more inefficient,’ I asked a fellow traveler. ‘It’s good, it just means they’re chilled out’ – well yes, I would be chilled out as well if I was continously living in an opium daze; without having seen any statistics I’d bet Laos is the one country with the highest percentage of opium smokers) and besides paying for the visa itself – which is 35USD, not cheap by any standard – you also have to pay a ‘fee service’ of 1USD and3000 kip (€0,30) for an ‘H1N1 check’ that is ostensibly fake: they supposedly take your temperature by pointing something like a barcode scanner at your forehead. Prices are always communicated by typing the number in a calculator and showing this to the other party, but they were rather surprised when I handed them back the calculator with 35 punched in, while I pointed at the visa pricelist. They pointed at the sign saying I had to pay one dollar for processing, and were quite offended when I said there was no such thing and that they had made it up. “You want to pay more? OK, you argue, you pay five dollars more”. Apparently, others realized this only it made it more obvious the fee was not official and were quick to try to convince me that no no, it was, in fact, an official government charge, and the guy with the barcode scanner (he could not have been older than 20 and looked rather mentally challenged) was a doctor who had to check for H1N1 (no matter that international treaties prohibit such medical checks as a condition for entry). They got really pissed when I told them this was corruption – asking in an aggressive tone why I would say such a thing, and offering / threatening to give my money back while at the same time cancelling my visa. Wisely, I hung on to my passport. It was also possible to have a chat with the chief upstairs (literally; they weren’t threatening to kill me) but I – again, wisely – declined. Besides, there was a bus full of people waiting for me, so I made my way out of the checkpoint. Some (most) people might think it’s only a dollar (‘petty overcharging’, my guidebook says), but in my view there’s no such thing as insignificant corruption. By paying without any protest you’re enabling corruption; I think if we have one ‘duty’ as Westerners it’s to not enable corruption, even petty corruption like this, in whatever small way possible. My protests are not going to achieve anything, obviously; I’m not delusional. But if every tourist passing through here got angry and called them out things might very well change. We reach Muang Khua around 1.30pm. The road turns sharply downwards and then disappears into the Nam Ou river. Muang Khua is on the opposite bank, where the Nam Ou and Nam Phak meet. We’re ferried across in a narrow longboat. The town itself is ramshackle, but the picture is strangely fitting. A bend in the river, a dusty road; houses on stilts. Around it, the river flows brown; green forests on the opposite bank. As I sit on a terrace overlooking the Nam Ou, darkness falls, the sun, as always in the tropics, sinking rapidly. Before 6.30pm the night is pitch, the city becomes quiet, and the jungle comes alive with the deafening chirping of a million insects. 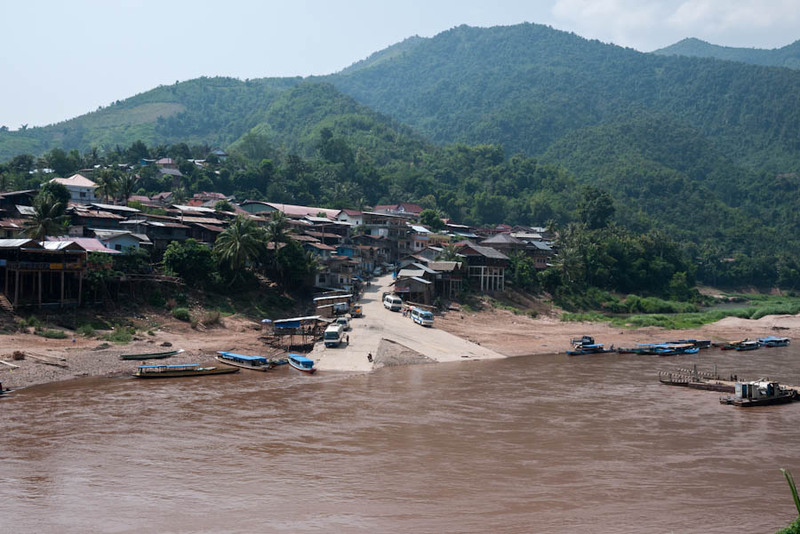 After a few days at Muang Ngoi, I hopped on the boat to the old capital of Luang Prabang. It’s an hour to the first town that is accessible by road. 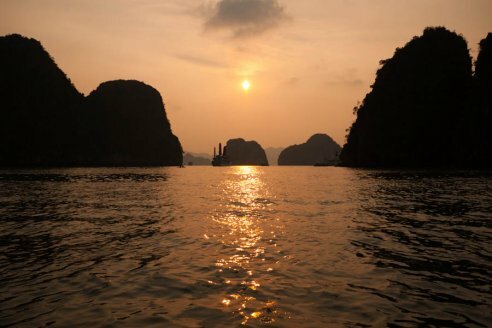 From there, it is theoretically possible to take the bus, but the boat is almost as fast and much more comfortable – gliding along the Nam Ou and Mekong instead of bouncing up and down like a cocktail shaker. But that’s not all. On the boat from Muang Khua, we were seated on wooden benches, facing sideways. This one has aircraft seats facing the front. This is as comfortable as traveling in this part of the world gets. At dusk, I’m back in civilization. The air is hot and polluted outside, on the station platform, but getting on the train is something else entirely. The train doesn’t smell, it reeks; some stench permeates the carriage. It’s the cigarette smoke of ages and general stuffiness, but there is something darker there as well, a smell that I can’t quite place but that I feel I instinctively know and that repulses me. Even after spending several hours on the train I haven’t gotten used to it. But what can you do but endure it? I wasn’t even supposed to be on this train. Or rather, I didn’t want to go to Vietnam this quick. But I overlooked the fact that it is National Week in China. Meaning that from October 1, 1.3 billion people have a full week off. And considering that October 1 is a Monday, people really have 9 days off in a row and so there’s no trains, no accommodation anywhere, and everywhere is ridiculously crowded. So there was nothing left to me but to get to Vietnam ASAP. The only alternative to this train was a 30 hour hard seat ride to Nanning in Southern China. I passed. This is actually the same train, but apparently the international section has separate carriages and I was able to get a soft sleeper. I’m sharing the compartment with Chris. Chris is riding his motorcycle down from the UK to, well, all the way to New Zealand if he can make it. He was banned from taking his motorcycle into China, however, after one person in his group drove off without the guide’s permission (you can only enter China with your own vehicle if you or your group have a guide 24 hours a day). So he’s shipping his bike from Mongolia all the way to Bangkok. It makes for interesting conversation, and the 40 or so hours feel like a breeze. Beijing is different than I remember it. And it’s not just that is 27C now where it was 37C last year. It’s Beijing itself that has changed, and it’s unbelievable to see how much it has changed in just one year. I still remembered the way when I got off the subway, but I had to look twice – at first I thought I took the wrong exit. Buildings that were there then are now not, while others that weren’t, are. The cute little bakery on the corner of the street where my hostel is is now gone, replaced by the 566th branch of a hole-in-the-wall fastfood chain. The other corner now has a McDonalds, housed in a brand new building. As far as I can remember, there weren’t even any signs that they wanted to demolish the building that stood there last July. 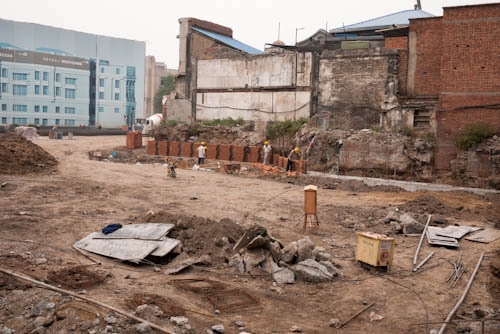 An entire hutong block that I explored last year, filled with little restaurants and eateries, is now gone – just gone. Only now can I really comprehend how much Beijing must have changed in the last five or six years, in the run up to the 2008 Olympics. But I’m happy to be here, even if it’s not quite ‘like the proverbial pot of gold at the end of the rainbow’, as Lonely Planet put it. For the past weeks, I’ve been constantly on the run, and this is the first time I can finally take things a bit more slowly. Add to that very fine autumn weather – about 27C during the day, 18C at night. And Bastiaan is here – in fact I think I see him more often here in Beijing than I do back home – and it’s always nice to meet up with friends in a place like this. One thing Bastiaan did was arrange for me to come with him and a group of his fellow students to hike the Wall from Gubeikou to Jinshanling. One trip to the Wall I won’t soon forget. Last year I was at Badaling, where the wall is basically a new structure; the steps you are climbing are twenty years old at most. While Jinshanling is partly ‘restored’, Gubeikou is at parts almost completely original Ming-dynasty Wall– or what’s left of it anyway (Mao encouraged the use of the Wall as a source of free building material for new homes or whatever – that alone should be enough to rank him among the worst criminals in history). Also, there is a military base that you have to walk around or be shot on sight, so it’s pretty adventurous all in all. The above view, however, is not what made this trip so unforgettable. Neither is the fantastic four to five hour hike, first over and then alongside the wall. The unforgettable part came when we got to Jinshanling, and found a lady in green guarding the tower we had to pass through. 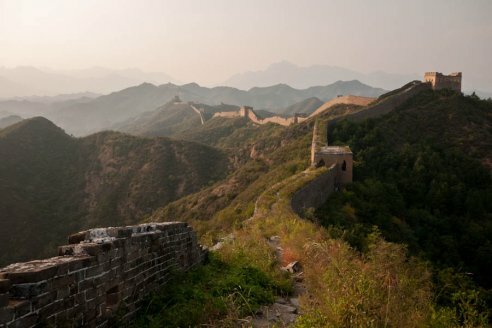 While uninvited foreigners crossing the wall would probably have paid with their lives in the old days, her demand was rather more prosaic – a ticket to Jinshanling Scenic Area, weighing in at 65Y (about €8). We had, however, already paid at Gubeikou. And with half of our group Chinese or at least fluent in Mandarin, an argument soon ensued. And this is the part I’ll never forget. Those sweet girls turning sour, shouting at the top of their voices at the lady in green, who wouldn’t budge, wouldn’t let us pass without buying the ticket, wouldn’t give us a discount. But there were eleven of us and only one of her, and soon (well not soon, for they argued for at least 20 minutes) we were scaling the tower on all sides – a group backtracked some 200 meters, descended the wall and passed the tower on either side at ground level. Bastiaan climbed in through one of the tower’s windows, but was . When the others turned back to descend as well, the lady turned her back on us and started slowly to cross to the other side of the tower. This was the moment I had been waiting for, and I quickly sprinted passed her, avoiding the need to backtrack and trod through the bushes. The lady in green was now in full retreat, but had signaled for help. Not by lighting a fire in the tower as they did in the old days, but by cell phone. At the exit, two guards (police? Private security? Somewhere in between? We’ll never know) were waiting, blocking our way. And the argument repeated itself. I sadly forgot to take a picture of the lady in green blocking the way, and missed the most heated part of this argument, when three of ours were in a shouting contest against three of theirs, but you get the idea. Your browser doesn’t support video. Video is supported by the latest version of Internet Explorer, Google Chrome and Safari. By now, this had become a matter of principle. Indiana Jones-guy had found an easy way off the wall some 100 meters back from where we could get around the guards, onto a terrace of sorts, and Bastiaan and I went down to create a diversion. The lady in green had spotted us and went down to the terrace to block the way off of the terrace, while the rest of the guards continued to hold up our group. However, she chose a poor position to guard us – about halfway between us and the narrow exit. There was a statue right before the exit and Bastiaan and I decided to each walk around a different side, so the lady in green couldn’t catch us both. And then Bastiaan was out, and the guards finally acknowledged their defeat. The lady in green hopped on a moto, calling after us with her final bluff: ‘Later! Ticket later!’ The two guards followed soon after, and the rest of our group had an easy walk down. There was no ticket control later. I spent the rest of my time near lake Baikal pedaling around on a crappy bicycle. And then it was time to head to Mongolia. The train left Irkutsk at 10pm, arriving some 32 hours later. The distance between Irkutsk and Ulan Baatar, the capital of Mongolia, is only 1132km – that works out to just 36km/h on average. Indeed, everything about this train is excruciatingly slow and annoying. Crossing the border takes almost five hours – and that’s only the emigration at the Russian side; the Mongolian immigration process takes another three hours. At least we were allowed to get off in Russia. The train station there has a brand new lounge, if nothing else. There is no shop, no restaurant, not even a coffee vending machine. There is a market, but there is almost nothing on sale. The two goats roaming around the station we passed a few hours ago in hindsight look like a real source of entertainment. Mongolian customs officials are the most unfriendly I’ve ever seen. At sunrise, the train slowly chugged through the seemingly endless suburbs of Ulan Baatar. I’ve heard it said that in Mongolia, everybody has a right to pitch a ger somewhere, put a fence around it and claim the land as their own. The apparently complete absence of any form of city planning in these parts (and the more-than-occasional ger alongside roads, apartment blocks and factories) certainly seem to support that statement. We were picked up by the Dutch owner of the Eco Ger Camp. I had imagined this person to be some sort of hippie, or at least some sort of idealist, the type with white socks in his sandals; otherwise why marry a Mongolian woman, live in Mongolia and set up an Eco Ger Camp without running water or electricity? But the owner turns out to be Bert from Amsterdam, and upon seeing him for the first time I can’t help but imagine that in a previous life he sold fruit on the Albert Cuypmarkt, with his obesity, oily hair and bulbous nose. In theory, they drive on the right side of the road in Mongolia. In practice, they drive wherever the road has is the least horrible. And the roads really are horrible outside of Ulan Baatars centre, leading to a crazy slalom, travelling the full width of the road, and often a bit more, to avoid to worst potholes (those that are big enough to swallow a small car). At rush hour, traffic turns into some sort of crazy obstacle course waltz, with oncoming traffic swerving over to your side while your driver swerves over to their side and drivers trying to avoid each other as well as the shock absorber crunching potholes. Adding to the fun is the fact that about 70% of the cars have the steering wheel on the wrong side since most cars are imported from Japan (where they drive on the left). Our ger camp can only be reached by horse cart. 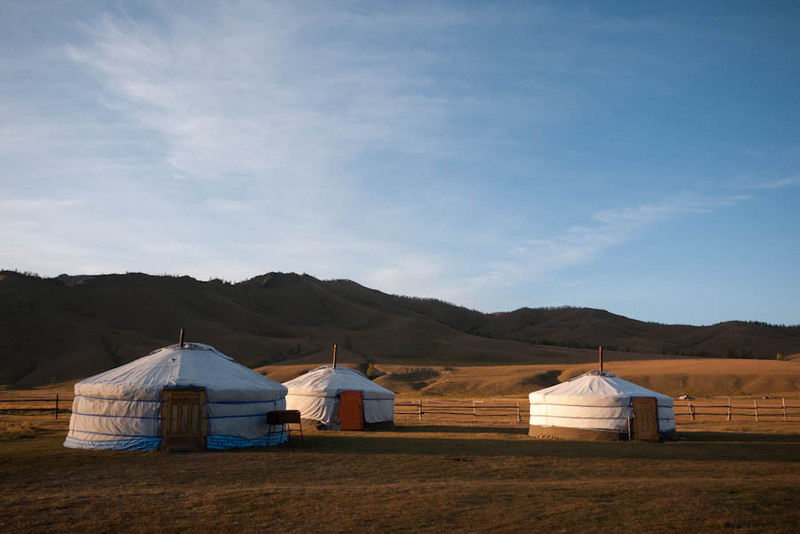 Though not too far from the entrance of the national park (about half an hour by horse cart), the camp really is out there, set among rolling hills and outstretched plains. I was sort of looking forward to yakmeat and tea with yakmilk and yakbutter, but Bert’s Mongolian wife cooks up Dutch fare – soup with meatballs; watery chicken curry; meat, potatoes and vegetables on the side. White bread with cheese, cold meats and jam for breakfast and lunch. But nevertheless, the camp is the real deal. Traditional gers, no electricity or running water. You have to flush the toilet (the only toilet) by pouring water from a jerry can, and you can basically forget about washing your hands. The gers are cold at night, and one time I feel a mouse running over my back (I think it tried to get into my sleeping bag to escape the freezing cold). Three hours of horse riding was included, and though I really wanted to go, I was also somewhat apprehensive. The last time I sat on a horse was probably 15 years ago and I am absolutely sure that my karma will kick in here, that the horse will throw me off for all those times when I laughed at my sister and said that riding is not a sport, the horse does all the work. This is the day after I sprained my ankle, and I cannot even get onto the horse without help (because my ankle offers no support, I can’t swing my other leg over the horse, like when getting on a bike). The guide, who looks like he could ride while sleeping (and he probably can, and does), helps me up and takes the reins; for the first part of the ride, all I can do is sit. But I apparently do this very well, because before long the guide asks (through the Japanese interpreter) if I can ride by myself. My reply (“I can try”) is apparently translated as “yes” and the guide trots off, leaving me to follow, nudging my horse through the scrub, crossing brooks and galloping the last mile home. The last leg of the train journey crosses the vast Mongolian plains and the Gobi desert. The train is still running slow, the landscape slowly changing to the rhythmic clanging of the wheels. From the train, nothing can be seen but nothingness. Dust-covered towns are few and far between, but make me wonder why – or how – anyone would live here. Sorry, your browser doesn’t support this video. Video is supported by the latest version of Internet Explorer, Google Chrome and Safari. At the border with China, the wheels of the train are changed, because Chinese trains run on a different gauge (Mongolia uses the Russian gauge, where the rails are further apart than in most of the rest of the world). At midnight, we entered China. Next morning, the landscape was completely changed. We had crossed the Gobi, and were already nearing the mountains surrounding Beijing. The diesel engine was gone, the “air was fresh and the sky was high,” as the Chinese say about the autumn season in this part of the country. I was anxious for the train to get to Beijing, and in fact the last two hours of this leg were the only moments where I just wanted to ride to be over, to arrive. September 21, 2012, 07.30. Somewhere between Ulan Baatar and the Chinese / Mongolian Border. This is the last leg of the Trans Mongolian train. I’ve already covered 9000km from Amsterdam to Ulaan Baatar. This leg will add another 1500-odd-kilometers to that, so that by the time I get to Beijing, I will have travelled 10.500km by rail. With so many impressions, it’s hard to recall and write about the experiences of the past two weeks. I haven’t had a good night’s sleep in two and a half weeks, and every muscle, every joint in my legs hurts. I’ve caught a nasty cold and sprained my ankle hopping across some tree logs in Mongolia. My body pulled the emergency brake yesterday and I spent most of the day in bed, so I didn’t get to see Ulaan Baatar. But I feel elated. What can I tell you? I remember a night drowned in vodka in Moscow (or rather I mostly don’t). I remember my appointment with Lenin. The Kremlin, with all its churches. The supposedly fancy art district in the old chocolate factory, completely deserted when I got there. The dismal weather, the cold, the rain. And I remember the train to Irkutsk. Crossing six time zones in well over three days and spending four nights on the train, this was by far the longest of my train rides. I had replenished my vodka stock (the bottle I brought with me was put to good use that one night), bought both War and Peace and Anna Karenina, and brought chocolate and dried fruits to hand out (it “used to be de rigeur,” according to the Lonely Planet). I knew four Dutchies would take the same train and didn’t like it, but nothing could have prepared me for the shock that was to come, for in my carriage alone I found there were ten Dutch people. All in all I counted no less than 35 on the train. Of these, some 20-odd people were on a guided trip with Tiara Tours (of all travel agencies). And all of them would get off at Irkutsk, same as me. So much for an authentic experience. Thank god only one of the Dutch was in my compartment, a middle aged woman named Mechteld, the other two being Russians. By the time I got to Listvyanka, I was used to the Dutch, and four days later still, when an old diesel engine pulled the train through the the outskirts of Ulaan Baatar, I could even laugh about it, but at that time I wanted nothing more than to jump of the train – or better yet, find some clever ruse that would leave them stranded at the next station, Duffilled and all. But what was to be done? So I sat down, and handed out food to the Russians, who did the same. The train was a modern one, air conditioned and all. Sadly, Russians turn up the heat to at least 25C in winter. I have never been able to figure out why this is so. What I do know is that this made the journey a living hell, as no windows could be opened (because of the air conditioning). At night, with four people sleeping in a compartment that is at most 10m3, with the door closed, it became almost impossible to breathe. The corridor was slightly better, though it was still stuffy. Unable to sleep, I lay naked but for my boxer shorts on one of the top bunks. The days were slightly better. The first was a monotonous blur. Endless, dense birch forests, the train going in a straight line at a constant speed, the rhythmic clanging of the wheels on the rails. Mechteld knitted. The intermittent stops were, at least to me, the only definite proof that we were actually moving forward, and not going around in a big circle of sorts. I bought pirovsky with meat and vegetables, and pancakes with cottage cheese. Mechteld knitted. The second day brought better weather, but no change in scenery. Mechteld knitted. I found out that the air conditioning could actually cool as well – as soon as the sun was beating down on the train, fresh (relatively speaking), cold air flowed in from the vents. Bliss. Before long, it was actually cold in the train (in summer, Russians set the air conditioning to 18C. I have never been able to figure out why this is so). Mechteld knitted. On the third day – we were now well into Siberia – the forests began to give way to rolling plains. The stations we halted at became more and more basic, with the notable exception of Omsk, with its grand hall, huge chandelier and Lenin statue. Mecheld knitted. I was halfway through Anna Karenina. Then came the last night, and an early rise to get off in Irkutsk, were a transfer would be waiting to take me to Listvyanka and Lake Baikal. Sorry, your browser does not support this video. This video is supported by the latest version of Internet Explorer, Google Chrome and Safari. Listvyanka is named the ‘Baikal Riviera’ in the Lonely Planet. With 1800 inhabitants, however, it’s barely a dot on the map. In fact Google Maps does not have a map for Listvyanka. It just shows a dead end road where the town should be. Then again, that is not too far off, for Listvyanka is in fact a dead end road lined with hotels and five dead end dirt roads that lead inland. But the weather has held and sitting near the deep blue lake, under a blue Siberian sky, basking in the sun, I have everything I need.